Happy Tuesday!! Yesterday we restocked our Rachel Parcell Megan Tee and brought back a new color… PINK!!!!!! This tee has been one of our best-sellers (we’ve already done two re-stocks) and it’s going fast! You can shop it here! Simple and chic.. that’s a summer outfit at its best. I love how that top is classic and slightly edgy. It is so cute! You always have the best denim. It doesn’t look nearly as good on the models in the store descriptions, but you make them look so good I’m always jealous of your jeans! Great look. This is just too cute Rachel!! Such a cute blouse! I love that it can be dresses up or down! I just did a post on my own blog about how I dress up my go-to’s for casual wear (White tee and jeans) and then I see this! Your look is the perfect example of dressing up a white top and denim while still looking stylish! Amazing! I definitely want to purchase this top though. It’s so cute. 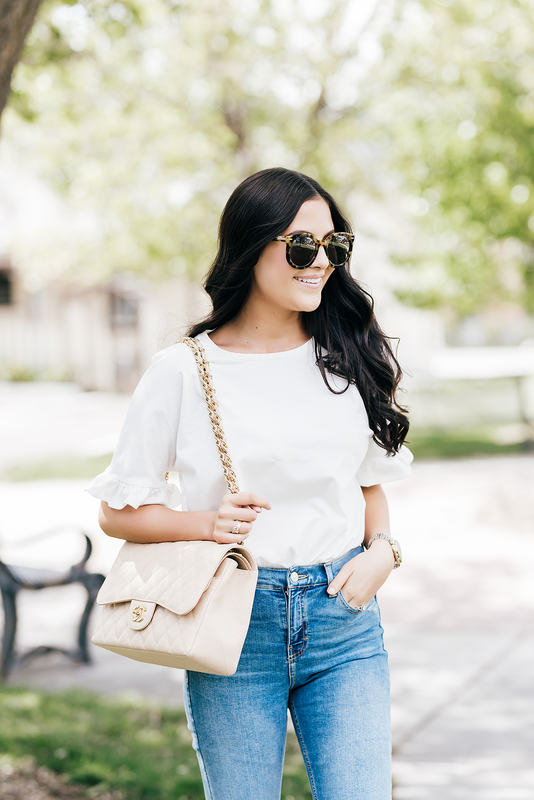 I love this twist on the classic white tee! Such a cute tee! 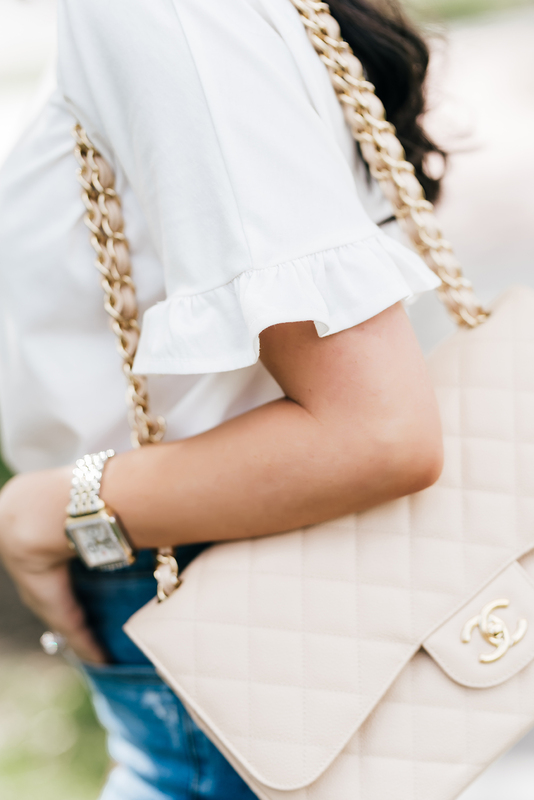 Loving that little ruffle detail. 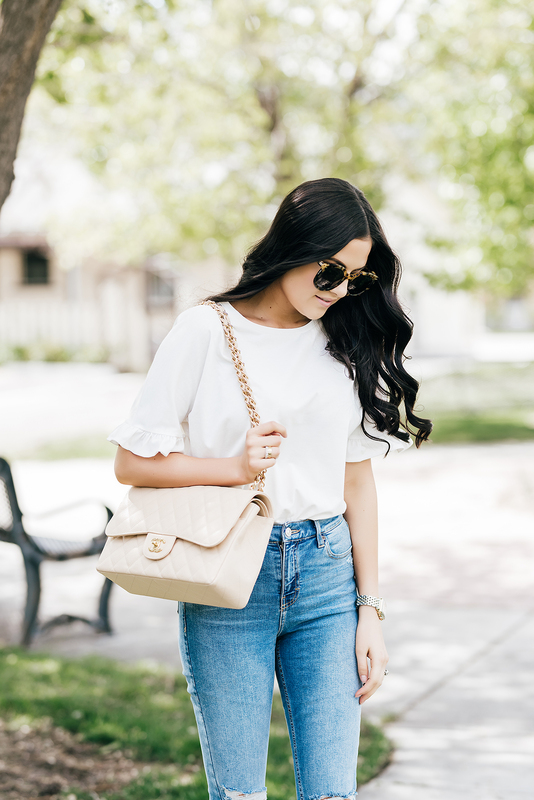 Perfect neutral outfit! It looks so cute with the little ruffles! And looks like it could be cute casual or elegant and dressy with a skirt. I love the sandals on this look! Can you please do a post on how you do your makeup? I’ve been a long time follower, and your makeup has changed from beautiful to flawless! I love it, and I would love to know what foundation, concealer, mascara, etc. you use! Aww! The “Megan Tee” named after your sis? So sweet! This outfit is so weekend perfect! Love the top too! And that Chanel!!! Looks like I know what my next RP purchase will be! Seriously, your collection is always SO GORGEOUS and I want everything! The ruffle detail is super cute! Love this simple yet chic look! Great simple, casual combo and you’re looking flawless as always! You have the best casual style girl! I am absolutely in love with this top and those Steve Madden sandals! You look great in this outfit! Love the hairstyle too.